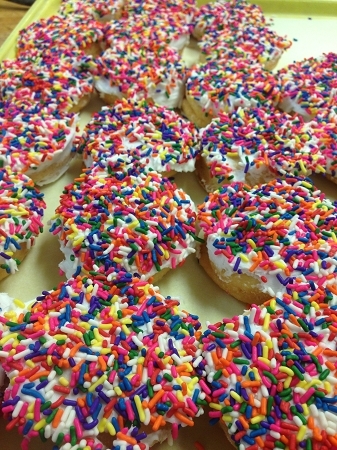 Our famous donuts, covered with buttercream and dipped in sprinkles Allergens: Soy (Frosting,Sprinkles), Egg, Corn ***PLEASE NOTE*** that during Summer, we will no longer be shipping Sprinkle Donuts. They do not ship well in the heat. They can be purchased in store only during the summer. Once it gets cooler, Sprinkle Donuts will once again be added back to our shipping menu. We are sorry for any inconvenience this may cause. I love a good sprinkled donut and this one is so dang delicious. I can't stop at just one. These donuts are fantastic! You would never know they were gluten-free. My daughter will LOVE these.